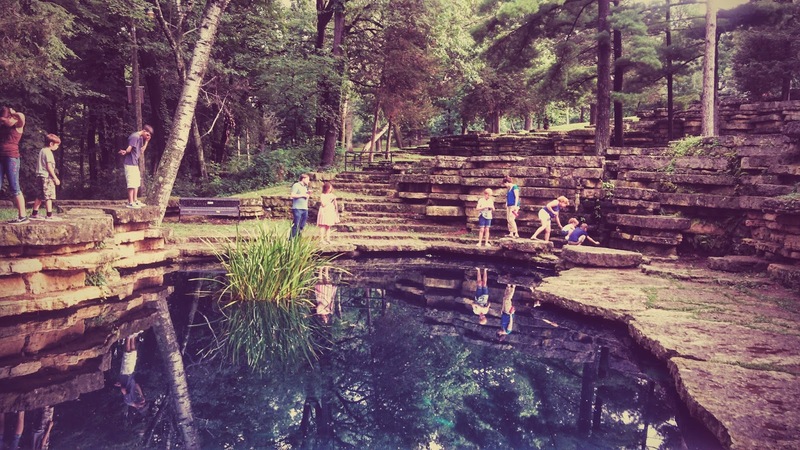 A Homeschool Story: Eagle Point Park: A History Lesson, A Family Picnic and A Fascinating Legend; thank you, Ben, my littlest brother, for the photo! Eagle Point Park: A History Lesson, A Family Picnic and A Fascinating Legend; thank you, Ben, my littlest brother, for the photo! According to the Encyclopedia of Dubuque, the naming of the hill has its roots in 1828-29, when an eagle's nest was found in a tree near Dryden, N.Y. The tree was cut down and the eaglets captured. A local merchant raised one of the eaglets and gave it to a silversmith. The silversmith banded the eagle with an inscription and set it free. A Native American, hunting along a bluff overlooking the Mississippi, shot the eagle, but he was startled by the silver band, having never seen one before. As news of the eagle spread, the bluff upon which it was shot became known as Eagle Point. The name of the park, sadly, coincided with the demise of the eagle in Iowa. A nesting pair reported in Jasper County in 1905 would be the last active nest in our state until 1977, when one was spotted in Allamakee County. Since then, eagles have thrived. Once again, eagles are a common sight in and around Eagle Point. The architect chosen for the project was a visionary; Alfred Caldwell, who created prairie-style structures, in harmony with the land and the natural terrain. The limestone used is native to the area; all of the cliffs and bluffs surrounding the Mississippi here are of limestone. As a child, I suppose, picnicking at Eagle Point ruined my appreciation for any other park. The rest of them were just so...tiny and blah. I did love Swiss Valley, because we could go creek stomping...when my mother wasn't looking! Thank you, again, my fabulous family, for coming together and getting the next generation out to the park, at least once a year! I left a good many, never published, comments on your blog while you were in France, so I still don't know if you even get my comments. But I do read your blog faithfully and check several times a week for updates. Loved your Eagle Pointe post. You must tell me where it is. I'd love to go there. I'm so sorry. I just counted the comments from you from France; 2 is the grand total. I published every one of them. I have a similar problem; only sometimes do my Google comments go through on a Wordpress blog, even if I try to go back and use my Wordpress account. Eagle Point Park is just an hour away; in Dubuque. The whole concept was a powerful but simple one: "A city should have at least one large park, so extensive in itself and in the vistas it affords as to seem a bit of country, thus presenting to tired city dwellers the greatest possible urban contrast." - Charles M. Robinson, "Report on the Improvement of the City of Dubuque, Iowa," 1907. He also said, upon visiting Dubuque as a consultant, "I have never seen a place where the Almighty has done more and mankind less, than Dubuque," Way to make'm move! Eagle Point Park was a success of both the original and second projects. Sad, I left at least several more in other of your France posts. Call-out to Blogger and Wordpress and all other blogging hosts/companies...you can call yourselves as you wish, but could you not talk to each other? Nicely? It is truly frustrating to hear from readers that they tried to comment and could not on my blog. It happens to me all the time as well...and I try very hard to think before I post a comment for someone else's blog; that means I took TIME to do it. Please clean up your act and fix comment functions. Mama Fitness: Don't Stop: Pain or No Pain! Mama Fitness...or This Stinks. Rants and Raves.